Subaru has confirmed the pricing and specification for the brand new Levorg Sport Tourer, which goes on sale at the end of August. With only one available trim level, called GT and priced at £27,495, the new Levorg Sport Tourer is more expensive than mainstream estate cars like the Ford Mondeo, but looks good value alongside the German premium set. With all-wheel drive, a CVT automatic transmission, a parking camera, 18-inch alloy wheels, dual-zone air conditioning, leather heated sports seats and a touchscreen navigation system all standard, the Levorg certainly plays a strong hand in the standard equipment stakes. It’s also very large, on paper at least, with a 522-litre boot extending to 1446 litres when the split-folding rear bench is down. By comparison, the Ford Mondeo Estate offers 500 to 1605 litres. Pace will not be this Subaru’s strong suit, however, with the single engine choice a brand new 1.6-litre DIT ‘boxer’ diesel unit, developing 170PS and 250Nm for an 8.9-second sprint to 62mph. And while it offers the same level of performance as the outgoing 2.5-litre diesel in the Legacy, and is more efficient, it’s still no eco car. Subaru claims almost 40mpg and 164g/km CO2. That puts it in VED Band G, good for a £180 yearly payment, while its first year rate from 2017 will be £500. 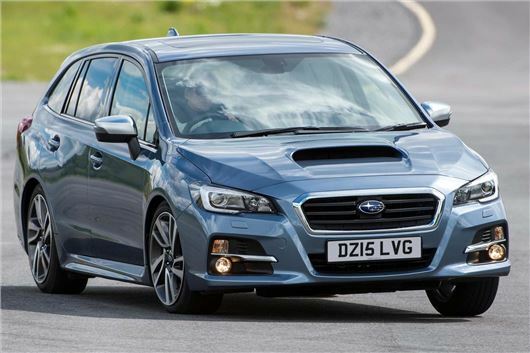 But the Levorg should drive with the same sort of grippy vigour as virtually every other Subaru, boasting dynamic systems including Subaru’s Symmetrical All-Wheel Drive, electronic Vehicle Dynamics Control, and Active Torque Vectoring. A switchable Sport mode sharpens up the driving experience, too. Already on sale in Japan, the Levorg made its world debut at the Tokyo Motor Show – you can read that story by clicking here.